I just finished reading Elizabeth Gilbert’s book about creative living called “Big Magic.” I don’t want to spoil what “Big Magic” is, so I’m leaving it to you to find out. I recommend it to everyone–because we’re all creative people, in our own way. What this book will teach you is how to become brave with your creativity, not care too much about it, learn to trust it, and then enjoy it. I loved how she explained throughout the book that we shouldn’t choose the way of the creative martyr or tortured artist, but to consider a new way of taking on creativity: through the eyes and energy of a trickster: playful, fun, light. She admits that sometimes we need fear (the kind that, keeps us from danger), and that it is inevitable–fear will always be there. Instead, she suggests allowing it to come with you and creativity, but that it has no power. You’re the one in charge. It just gets to sit there and watch. There’s a wonderful speech she writes to fear and it’s too long to type again here.Go get the book. Look for it. Copy it down and pin it up on your wall. “Don’t let go of your courage the moment things stop being easy or rewarding…That’s the moment when interesting begins. Every part of this book was insightful. I learned so much and now that I’ve returned it to the library, it’s going to go to the next person. I hope they are as touched by it as I was. I hope they decide to be brave and embrace their creativity. And just a thought of mine: YOUR CREATIVITY IS NOT USELESS. It’s something you’ve been curious about, created, and have either kept it for yourself or have shared it with the world (which I hope you do!) But it’s something you made. Creativity came to you specifically to start and finish that project. It is never useless. First, I just want to say how honored and excited I am to be able to share the following book review for Tara Stiles’ “Make Your Own Rules Diet.” I was shocked and surprised when I got chosen to write a review on my blog. I hope you all enjoy, and a huge thank-you to Tara! When I first saw a shirt with “Make Your Own Rules” on it, it changed the way I looked at myself. It was when I first discovered Tara through the television show with Tia Mowry, where Tia decides she wants to make a yoga video with Tara. I bought both DVDs. Then I found Tara’s YouTube channel, and instantly connected with the way she taught yoga. She made it accessible. She encouraged me to “make my own rules.” No one is the same–and we shouldn’t be forced to comply with rules that just aren’t fit for us. The way Tara guides you through yoga–encouraging you to do what feels good, to connect with your breath, and to forget forcing yourself into poses– made me change the way I looked at yoga, fitness, and even cooking. It didn’t surprise me when she announced that she was releasing a book about food– her “Tara Eats” videos and Tumblr blog recipes were just as easy and accessible as the yoga she’d guide me through on Youtube. 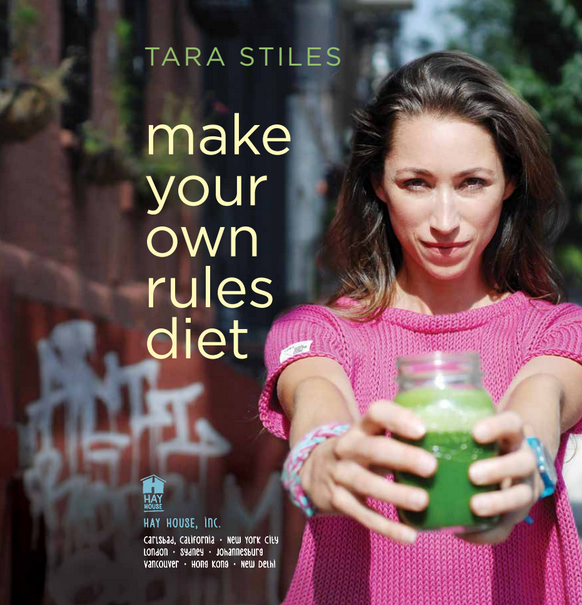 I love the way the book is laid out, with Tara separating “Make Your Own Rules Diet” into three parts that begins, not surprisingly, on the yoga mat, winds its way through meditation, and finally, makes its way into the kitchen. From downward dogs and easy breathing to your cupboards and kitchen counter, you certainly don’t want to miss this journey that Tara has mapped out. Throughout “Make Your Own Rules Diet,” Tara proves over and over again how simple yoga, meditation, and cooking healthily can be. Simple cooking is already great cooking to me, and Tara’s recipes are so delicious and vibrant in color that you’ll want to make them again and again. One example is “The Swamp,” a brilliantly green smoothie that is sure to leave you glowing, full of energy, and ready to take on the morning. If you find yourself often reaching for a not-so-great afternoon snack, then whip up a batch of her Granola, with an added twist that I adore: sour cherries. They add a perfect sour punch that’s sure to get you out of any 3 p.m. slumps or hangry (hungry+angry) attacks. And perfect for the upcoming fall season in which “Make Your Own Rules Diet” is being released, the Roasted Acorn Squash Soup is sure to warm you up during the colder evenings and shorter days. I’ve fallen in love with soup over the years, so I cannot wait to make this one. The “Make Your Own Rules Diet” journey will be worth it. I encourage you to pre-order “Make Your Own Rules Diet” before it hits bookstores in November, because you’ll want your hands on it as soon as possible. As a thank-you from Tara for pre-ordering the book, you’ll get the fantastic “Wake Up” yoga download and other cool gifts. You can pre-order the book and get your free gifts by going here. You can follow Tara’s inspirational updates about yoga, travel, food, life, and more on Twitter, Facebook, and Instagram. Make sure to subscribe to her YouTube channel for great yoga videos, and head over to her website for her weekly updates, recipes, and other happenings. Good morning and happy Monday everyone! I hope you had a relaxing and smile-worthy weekend. To kick off the week, I thought I’d share a few books (and other things) I’ve been reading to keep the chill off. Hi everyone! Tonight I wanted to share a stress tip I read last week over at Vitamin G, Glamour magazine’s health and fitness blog. I love this idea. When you underreact, you give yourself the freedom to relax and see the problem with clarity. I have tried this since I read it, and it has helped. Do you think you’d benefit from trying to underreact to problems? I found this link on Facebook today, and wanted to share with you: http://thewritepractice.com/17-reasons-to-write-something-now/. Do we need any more reasons to write? I can’t pick a favorite, but maybe you can? Which reason will be the best to motivate you? I adore Mindy Kaling. If you haven’t read her book, “Is Everyone Hanging Out Without Me?” you need too. It’s hilarious and I kept finding myself nodding in agreement with her humorous tales. So, the twenty minutes to sit down and watch the pilot episode. I loved it and cannot wait to watch the season. Go Mindy! One year ago today, I began Writing.Love.Magic. It’s amazing to celebrate one year! Thank you to all who have stopped by, read my posts, commented, and followed. I look forward to continue sharing with you. When I began Writing.Love.Magic., I wanted to focus on creating a positive space for others and myself. I wanted to share my interests in food, books, poetry, and inspirational writing with others. I was stumped on a name. Eventually, I landed on Writing.Love.Magic. Why? When you mix all the ingredients from a recipe, something magical happens. That’s what I wanted with my blog. All the things I loved, each a different ingredient in the recipe. Combined, they make something magical. I want to share the magic with you. I want you to create it yourself.